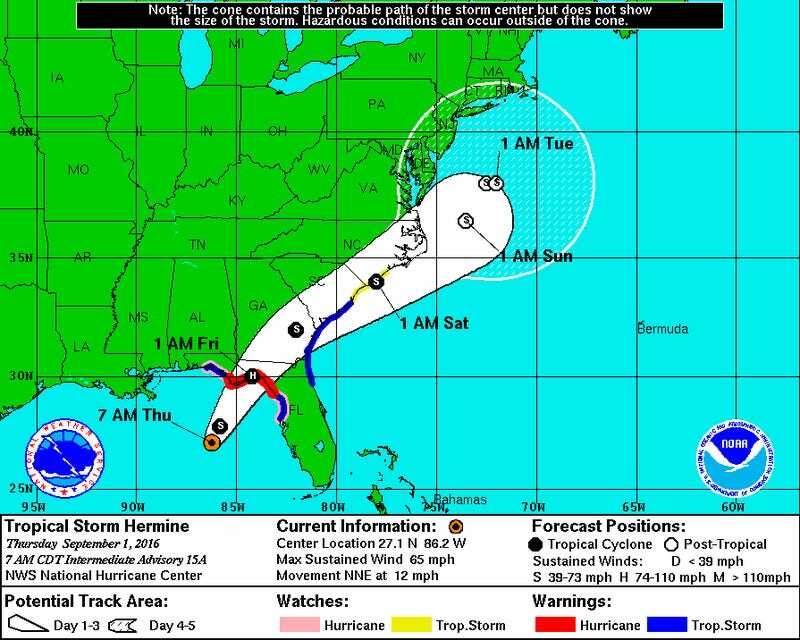 Millions of Americans are preparing for a wet and wild Labor Day weekend as Tropical Storm Hermine bears down on the southeast, threatening to dump up to ten inches of rain over portions of northwest Florida and southern Georgia through Friday. The storm, which NOAA’s National Hurricane Center upgraded from a tropical depression late yesterday, continues to intensify and could attain hurricane strength by the time it makes landfall later today. Hurricane and tropical storm warnings and watches are in effect for parts of northwest Florida, southwest Georgia, and eastern Alabama. After making landfall, Hermine is on track to march up the coast in a northeasterly direction, possibly delivering tropical rains as far north as Boston by the weekend. Late yesterday, the Washington Post’s Capital Weather Gang wrote that the most likely scenario is a nor’easter-like storm track, which would bring heavy rains and strong winds over the coastal mid Atlantic and possibly to areas inland of Interstate 95. This scenario, while by no means definitive, could cause coastal flooding and road closures near East Coast beaches that typically see a tremendous volume of tourists on Labor Day weekend. Alternately, the storm could hit the Outer Banks head-on, while narrowly avoiding beaches to the north. Either way, it’s a good idea to pay close attention to forecasts over the next 48 hours if you were planning to hit the beaches this weekend. Further south, an imminent deluge is looking pretty definitive. 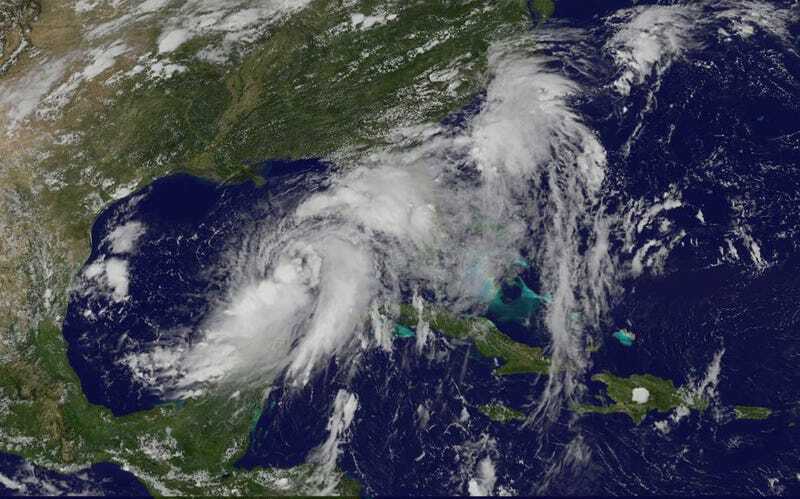 Forty-two Florida counties are currently in a state of emergency, with threats of storm surges up to 9 feet and dangerous rip currents throughout the weekend. For some meteorologists, the only question is whether the Sunshine State’s 11-year hurricane drought is about to end.